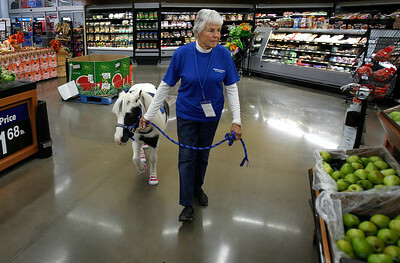 Matthew Apgar - mapgar@shawmedia.com Carol Swinford of Shades of Blue Ranch in Hebron leads Serebella, a 9-year-old therapy Falabella miniature horse, into Wal-Mart for a training session on Tuesday, Sep 29, 2015 in Johnsburg. Serebella has been training for 6 months in a variety of social scenarios to become comfortable in different surroundings. 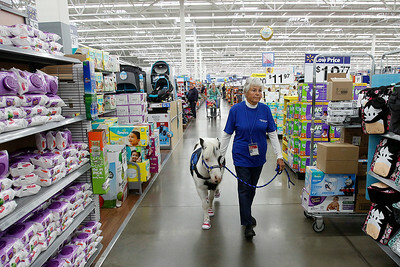 Matthew Apgar - mapgar@shawmedia.com Carol Swinford of Shades of Blue Ranch in Hebron takes Serebella, a 9-year-old therapy Falabella miniature horse, on a training session through the Wal-Mart Superstore on Tuesday, Sep 29, 2015 in Johnsburg. Serebella has been training for 6 months in a variety of social scenarios to become comfortable in different surroundings. 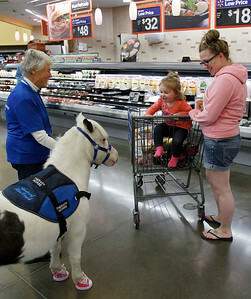 Matthew Apgar - mapgar@shawmedia.com Carol Swinford of Shades of Blue Ranch in Hebron and Serebella, a 9-year-old therapy Falabella miniature horse, stop to meet with Bre Moberg and her daughter Charlene Moberg, 1, both of Johnsburg, during a training session through the Wal-Mart Superstore on Tuesday, Sep 29, 2015 in Johnsburg. Serebella has been training for 6 months in a variety of social scenarios to become comfortable in different surroundings. 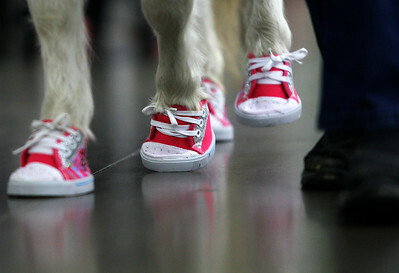 Matthew Apgar - mapgar@shawmedia.com Serebella, a 9-year-old therapy Falabella miniature horse, wears sneakers designed for teddy bears to help gain traction on the glossy floor on Tuesday, Sep 29, 2015 at the Wal-Mart Superstore in Johnsburg. Serebella has been training for 6 months in a variety of social scenarios to become comfortable in different surroundings. 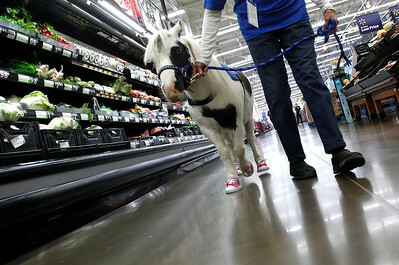 Matthew Apgar - mapgar@shawmedia.com Carol Swinford of Shades of Blue Ranch in Hebron takes Serebella, a 9-year-old therapy Falabella miniature horse on a training session through the Wal-Mart Superstore on Tuesday, Sep 29, 2015 in Johnsburg. Serebella has been training for 6 months in a variety of social scenarios to become comfortable in different surroundings. 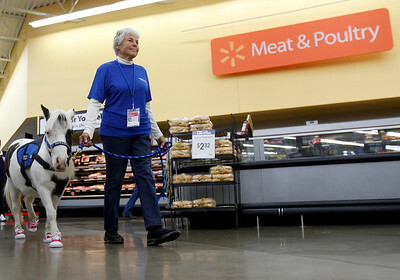 Matthew Apgar - mapgar@shawmedia.com Wal-Mart Superstore Pharmacy Technician Deborah Badzioch smiles as she reaches across the counter to pet Serebella, a 9-year-old therapy Falabella miniature horse being walked on a training session through the store, on Tuesday, Sep 29, 2015 in Johnsburg. 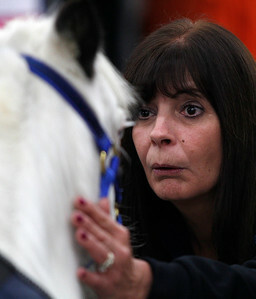 Serebella has been training for 6 months in a variety of social scenarios to become comfortable in different surroundings. 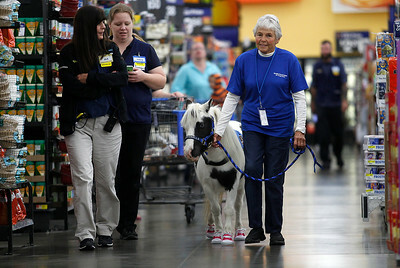 Matthew Apgar - mapgar@shawmedia.com Wal-Mart Superstore employees and customers stop to admire Serebella, a 9-year-old therapy Falabella miniature horse, being led through the store by Carol Swinford of Shades of Blue Ranch in Hebron on Tuesday, Sep 29, 2015 in Johnsburg. Serebella has been training for 6 months in a variety of social scenarios to become comfortable in different surroundings. 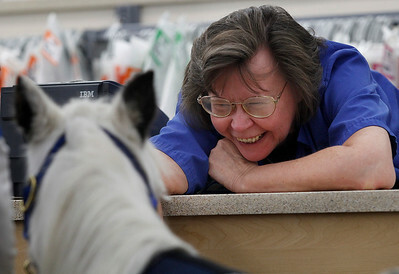 Matthew Apgar - mapgar@shawmedia.com Wal-Mart Superstore Health and Beauty Department Manager Julie Voight kneels down to caress Serebella, a 9-year-old therapy Falabella miniature horse being led through the store on a training session by Carol Swinford of Shades of Blue Ranch in Hebron, on Tuesday, Sep 29, 2015 in Johnsburg. Serebella has been training for 6 months in a variety of social scenarios to become comfortable in different surroundings. 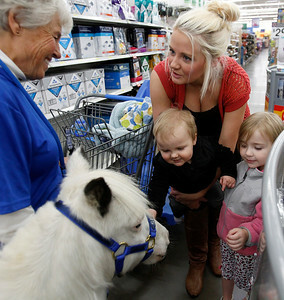 Matthew Apgar - mapgar@shawmedia.com Carol Swinford of Shades of Blue Ranch in Hebron and Serebella, a 9-year-old therapy Falabella miniature horse, stop to meet with Taylor Veach, right, and her children Ashtyn Veach, 3, and Layton Veach, 1, all of McHenry, on Tuesday, Sep 29, 2015 at the Wal-Mart Superstore in Johnsburg. Serebella has been training for 6 months in a variety of social scenarios to become comfortable in different surroundings. 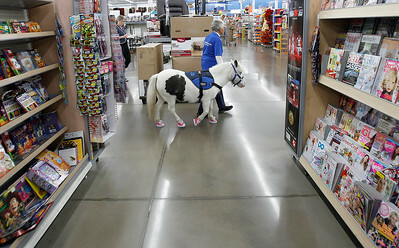 Matthew Apgar - mapgar@shawmedia.com Carol Swinford of Shades of Blue Ranch in Hebron stops with Serebella, a 9-year-old therapy Falabella miniature horse, at the pharmacy counter during a training session through the Wal-Mart Superstore on Tuesday, Sep 29, 2015 in Johnsburg. Serebella has been training for 6 months in a variety of social scenarios to become comfortable in different surroundings. 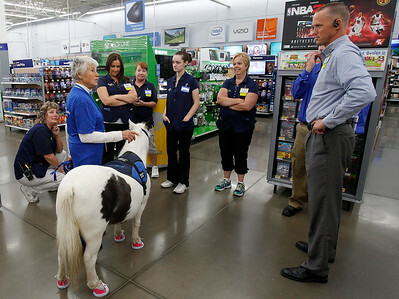 Matthew Apgar - mapgar@shawmedia.com Wal-Mart Superstore employees gather around Carol Swinford of Shades of Blue Ranch in Hebron and her 9-year-old therapy Falabella miniature horse, Serebella, on a training session through the Wal-Mart Superstore on Tuesday, Sep 29, 2015 in Johnsburg. Serebella has been training for 6 months in a variety of social scenarios to become comfortable in different surroundings. 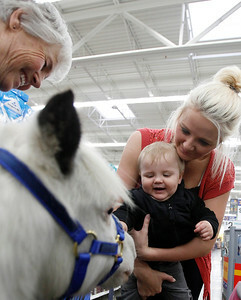 Matthew Apgar - mapgar@shawmedia.com Carol Swinford of Shades of Blue Ranch in Hebron and Serebella, a 9-year-old therapy Falabella miniature horse, stop to meet with Taylor Veach, right, and her son Layton Veach, 1, both of McHenry, on Tuesday, Sep 29, 2015 at the Wal-Mart Superstore in Johnsburg. Serebella has been training for 6 months in a variety of social scenarios to become comfortable in different surroundings. 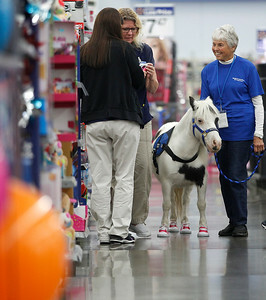 Matthew Apgar - mapgar@shawmedia.com Carol Swinford of Shades of Blue Ranch in Hebron, right, talks with Wal-Mart employees Julie Voight, left, and Linda Eaton, second from left, as Swinford takes Serebella, a 9-year-old therapy Falabella miniature horse, on a training session through the Wal-Mart Superstore on Tuesday, Sep 29, 2015 in Johnsburg. 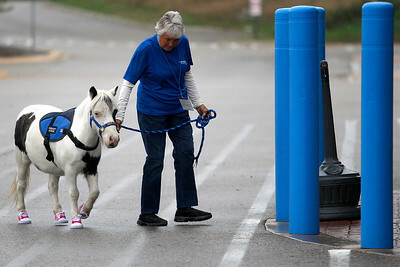 "What a tiny little lady with a tiny little horse," exclaimed Eaton to Voight upon seeing Swinford walking Serebella through the aisles. Serebella has been training for 6 months in a variety of social scenarios to become comfortable in different surroundings. 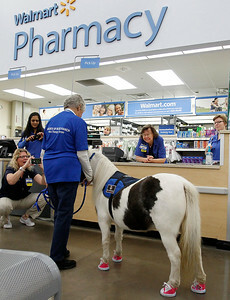 Carol Swinford of Shades of Blue Ranch in Hebron stops with Serebella, a 9-year-old therapy Falabella miniature horse, at the pharmacy counter during a training session through the Wal-Mart Superstore on Tuesday, Sep 29, 2015 in Johnsburg. 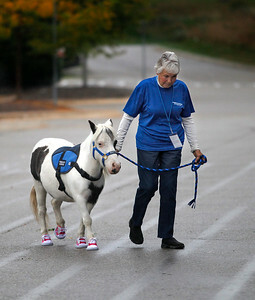 Serebella has been training for 6 months in a variety of social scenarios to become comfortable in different surroundings.